I had to whip up my courage to go to the Ukraine. There was a recent spate of political killings in the unhappy and lovely land, and the perpetrators never apprehended; among those killed was Oles Buzina, a renowned writer and a dear friend. Two years ago, well before the troubles, we had a drink under a chestnut tree in a riverside café. Buzina was in his forties, rather tall and slim, had a narrow sarcastic face of Mephistopheles, a bald head, a hint of moustache and a bad temper. He was a Thersites among the warlike nationalists of Kiev, laughing at their sacred myths of eternal Ukraine Above All. He called their beloved nationalist poet, the first one to write in the local dialect, “a vampire” for his predilection to bloody scenes. Buzina wrote in Russian, the language educated writers of the Ukraine preferred and perfected since Gogol, and he rejected the parochial narrative of the recent coup d’état. He was shot at high noon, in a street near his home in central Kiev, and the killers just vanished in thin April air. He was not alone: opposition journalists were killed, shot like Buzina and Suchobok, parliament members, governors and officers of law were defenestrated like Chechetov, MP in the “epidemics of suicides”. Were they killed by local extremists freely operating in the land, or did they become victims of Seal Team Six, the feared American assassins who kill enemies of the Empire by their thousands from Afghanistan to Ukraine to Venezuela? Who knows. Many more independent journalists and writers escaped by the skin of their teeth – to Russia like Alexander Chalenko or to Europe like Anatol Shary. I’ve met them in Kiev before the troubles, I’ve met them in their exile, and they told me of threats, of gangs of armed football fans and neo-Nazis roaming the land. I was scared, as in my advanced age I did not fancy a sojourn in a torture cellar, but curiosity, desire to see with my own eyes and judge for myself, and above all, the attraction of chestnuts in full tender bloom defeated the fear, and I took a rare Moscow-Kiev train. Always full in normal days, it was half empty. Other travellers were also worried: the Ukrainian border guards were known to arrest people on slightest suspicion or to ban entry after a few hours in a police cooler. The border guard that checked my Israeli passport was a huge man in a military camouflage with a large strip displaying his blood type in bold Latin numerals: IV Rhesus-. Still, he let me in after checking with his computer and asking a few questions. I was to see many soldiers and officers in battle dress all over Ukraine, as many as in Israel, perhaps. The Kiev government obviously took a leaf from Israel’s cookbook: schmaltzy advertising for military is ubiquitous, including calls to join the army, to support soldiers, to feed soldiers, to entertain soldiers, as if these soldiers of theirs are defending the homeland from barbarians. In reality, they are shelling and looting the breakaway provinces, like the Yankees in the Gone with the Wind. The looting made the war quite popular for a while with an average Ukrainian. That is, until coffins began to arrive from two major defeats of the Kiev army, under Ilovaisk and Debaltsevo. Pictures of young men who died fighting to regain Donbass are displayed in prominent places in Ukrainian cities – there are too many of these martyrs for a small victorious war. The stream of volunteers dried up, and the regime began drafting able-bodied men. A number of draftees chose to flee to Russia or went into hiding, but the army is being beefed up all the same – by the mercenaries of Western private companies as well. The Minsk agreements quelled the war, though shooting and shelling goes on. The Renewal of full-scale hostilities is still very possible: the US wants a proxy war against Russia. The regime may choose war for economic reasons as things go from bad to worse. Standards of living dropped sharply: hryvna, the currency, went down, prices went up, while salaries and pensions remained as they were. Do people complain, do they regret the February 2014 coup? Not really. They blame Russia’s Putin in all their misfortunes and refer to him by an obscene nickname. “Putin is envious of us for we shall join the EU”, a burly internet café owner in camouflage told me, though at that very time, in Riga, the EU leaders made it clear that in no way Ukraine will become a full member of EU. Rather, an associated one, like Turkey or North Africa. Militarist propaganda (“stand by our boys”) made an impact. As does the nationalist one. Many Ukrainians speak with palpable hatred of Russia, though with surprising ease they go to work and live in Russia if and when an opportunity arises. Russians believe that deprivations will sober the people of Ukraine, but it seems unlikely. The Ukrainians, like all Russians (and that’s what they are, for Ukraine is the south-western part of historical Russia, and as Russian as any place) are hardy, stubborn, patient, frugal and able to survive in most adverse conditions. A reverse could be possible: in 2004, the first Maidan coup (also sponsored by the West) installed a pro-Western president, but he earned universal scorn and failed to get re-elected. The second Maidan coup could suffer a similar fate, but this time the regime decided to ban the opposition parties. The Communist Party is banned, and the previously ruling Regions Party was dismantled and its members are forbidden to participate in elections. The Kiev regime does not need an appearance of democracy, as they have the West’s support. 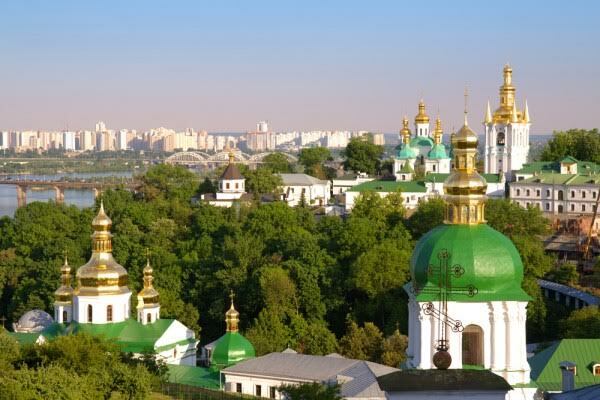 I do not want to exaggerate: Kiev is not hell on earth; it is still a comfortable city. People are reluctant to express their views in public, and some do not want to be seen with a man from Moscow, but their fear is not overwhelming. Communists and pro-Russian people in general are more likely to lose their job than their life. And a lot of Ukrainians look at Russia with love and sorrow, and express it. These are the Communists, who suffer daily threats; these are the Orthodox Christians, for the regime favours the Uniate Catholic Church of Eastern Rite and strong-arms the Orthodox from their churches; these are Russian-language writers and intellectuals who had their newspapers closed down and books removed; last but not least, there are industrial workers employed in still-surviving industries, for the Ukraine was the most industrialised part of Russia. In the South-East of Ukraine, they fight with weapons; elsewhere, a slow-going war of words and ideas goes on. What do they fight for? The Russian version of the story – ethnic Ukrainian Neo-Nazi followers of Bandera persecute Russians of Ukraine – is a great over-simplification. So is the Ukrainian version of Ukraine choosing Europe against Russia pulling it back into its unwanted embrace. The reality is quite different. You understand that when you encounter pro-Ukrainian Russians of Russia. They are numerous, influential, prominently placed in Moscow, as opposed to numerous but disenfranchised pro-Russian Ukrainians of Kiev. The civil war goes in Ukraine and Russia, and it is not ethnic strife, as both sides often pretend. This is the ongoing struggle between comprador bourgeoisie and its enemies: the industrialists, workers, military. This struggle has gone on since 1985, for 30 years. In 1991, the Empire won. The Soviet Union was undone. Its Industry and armed forces were dismantled. Science was eliminated. Workers lost their jobs. The state (in both Russia and Ukraine) became subservient to the Empire. This was a tragedy for ordinary people, but an opportunity for collaborationists. Many people prospered at the dismantling of the Soviet Union. Not only the oligarchs – a whole class of people who could get a piece at privatisation. The Western companies bought a lot of industries and dismantled them. The agricultural complex was destroyed. Russia and Ukraine were hooked to the global imperial economy: they bought manufactured goods and food from the West, or from China for US dollars. The only produce of Russia has been its oil and gas. There were two failed attempts to reverse the tide in Russia. Yeltsin blocked both with tanks. Worn and hated, he appointed Putin to succeed him. Putin was chosen and supported by oligarchs and by the West to rule Russia with an iron fist in a velvet glove and to keep it hooked and subservient. Very slowly he began to shift ground to independence. Putin’s Russia is still far away from full independence; it is far from clear Putin even wants that. Putin is not a communist, he does not want to restore the Soviet Union; he is loyal to Russia’s rich, he sticks to the monetarist school of thought, he trades in dollars through Western banks, he did not nationalise the many industries and lands taken over by the crooks. Still Putin’s became the third attempt to reverse the tide. He did much more than it was permitted by the Empire. He crossed red lines in his internal policies by banning Western companies from buying Russian resources; he crossed the red line in his foreign policy while protecting Syria and securing Crimea. He began to re-industrialise Russia, produce wheat and buy Chinese goods bypassing dollar. He limited power of oligarchs. But Yeltsin’s people, the Reaganite compradors, retained their positions of power in Moscow. They control the most prestigious universities and the High School of Economics, they run the magazines and newspapers, they have financial support of the oligarchs and of foreign funds, they are represented in the government, they have the mind of Russian intelligentsia, they miss Yeltsin’s days and they do love America and support the Kiev regime for they correctly see it as direct continuation of Yeltsin’s. Yes, there is a big difference: Yeltsin was an enemy of nationalists, while Kiev uses nationalism as the means to consolidate its hold. Kiev is also much more militarised than Moscow ever was. The common ground is their hatred of the Soviet past, of communism and socialism. Kiev decided to destroy all monuments of the Soviet era and rename all the streets bearing Soviet names. Moscow anti-communists loudly supported this move and called to emulate it in Russia. Gorbachev’s intellectual elite, elderly but still going strong, also supported Kiev’s resolute anticommunism. Putin hardly moved these people out of power. He cherishes his ties with Anatoly Chubays, an arch-thief of Yeltsin’s days, and with Kudrin, the Friedmanite economist. Recently he began to deal with their supply lines: Western NGOs and funds have to register, their transactions have been made visible and revealed huge financial injections from abroad into their media. Still, people identified as pro-Putin are a minority in Moscow establishment. So much for his “ruthless dictator” image! This duality of Russian power structure influences Russian policy towards Ukraine. A minority that is “more pro-Putin than Putin”, calls for war and liberation of the eastern provinces of the Ukraine. They see confrontation with the West as unavoidable. The powerful comprador group calls to abandon Donbass and to make peace with Kiev and with New York. They want Russia to follow in the footsteps of Kiev, minus its nationalism. Putin rejects both extremes and treads the middle ground, annoying both groups. The Kiev regime could use this reluctance of Putin and broker a good stable peace. But their sponsors want war. The breakaway Donbass was the power engine of all the Ukraine. The new regime is keen to de-industrialise the land: industrial workers and engineers speak Russian and relate to the Soviet Union and to Russia its heir, while Ukrainian-speakers and supporters of the regime are mainly small farmers or shopkeepers. This is a standard fare of ex-USSR: de-industrialisation is the weapon of choice for pro-Western regimes from Tajikistan to Latvia. Of Russia, too: the first thing carried out by pro-Western reformers in Gorbachev and Yeltsin’s days was de-industrialisation. It is said that Obama’s Transatlantic Free Trade Area (TAFTA) will de-industrialise Germany and France. Thus industrial Donbass has good reasons resisting its inclusion in the Ukraine, unless this will be a federated state leaving much of its authority to the provinces. Kiev prefers war depopulating the region. So in Ukraine I found a follow-up to dramatic events of 1990s. Who will win: the next generation of Gorbachev’s reformers in the nationalist folkish dress – or the industrial workers? Perhaps Putin could answer this question, but he is not in haste. In the second article we shall look at Moscow and its recent moves. Israel Shamir champions democracy for Israel and Palestine. Read other articles by Israel, or visit Israel's website. This article was posted on Friday, June 19th, 2015 at 4:45am and is filed under Currency, Democracy, Economy/Economics, EU, Russia, Ukraine.